Life’s a beach! 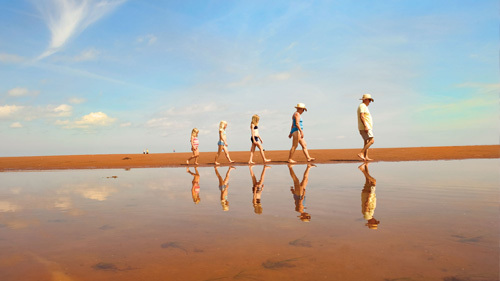 Stretching along 450 km of coastline of the Northumberland Strait are some 30 beautiful sandy beaches and the warmest waters in all of Nova Scotia. Closest to the Museum of Industry (approximately 30 minutes away) are 2 km of dunes at Melmerby Beach and the red sands of Caribou Provincial Park. Both have life guards during the summer, and are great places for a stroll the rest of the year. Find the heart of New Scotland at Pictou. Just 15 minutes away from the Museum of Industry, you can find the Hector, a replica of the vessel that brought the first Scots to Nova Scotia in 1773. While there, you can enjoy the Scottish-style stone buildings of this quaint town, stroll the revitalized waterfront and discover more heritage at the McCulloch House Museum, Hector Interpretive Centre, and the Northumberland Fisheries Museum. Eats and sleeps in Pictou County help you stay longer. Whether it is fast-food or fine dining, there is a variety to choose from just minutes away from the Museum. You can also find a selection of hotels, motels, inns, B&Bs, campgrounds and rv parks. Mill demonstrations of working equipment can be found at the Balmoral Grist Mill and the Sutherland Steam Mill, a beautiful drive out into the countryside and approximately 45 minutes from the Museum of Industry. Get active! Outdoor activities abound from sea kayaking, cycling trails, and bird watching at one of 12 provincial parks, or why not hang out ziplining? Use your orienteering skill with geocaching or take in the excitement at Riverside International Speedway with professional stockcar and NASCAR racing. Nearby you can find a round of golf at one of 11 courses, with six offering ocean views. Taste the sweetness of sugar maple at Sugar Moon Farm in Earltown. This working sugar maple farm offers free tours of the sugar camp (during the sugar season in March and April), pancake breakfasts, and exhibits explaining how maple syrup is made. During the summer months, the Farm is open weekends for delicious maple meals. All Aboard at the Train Station Inn in Tatamagouche. Rail buffs will love the opportunity to stay a night in one of the seven refurbished rail cars and enjoy a gourmet meal in a century old dining car. Celebrate one of the many festivals and events that are a part of the culture of the Northumberland Shore. From highland games competitions, Canada Day celebrations, sporting events, the Pictou Lobster Carnival, every weekend during the summer brings something for everyone to enjoy. Be Entertained! Pictou’s DeCoste Entertainment Centre offers its popular “Summer Sounds of Nova Scotia” series featuring Maritime singers, musicians, and dancers. Glasgow Square, situated on the scenic East River in New Glasgow, provides a central venue for concerts and is the host location for the annual three-day Riverfront Music Jubilee at the end of July.